I've been away from blogging for 8 days and I must say it was a nice break. But, I'm so ready to be back into my blogging routine and can't think of a better way to begin than with Carissa for Miscellany Monday. 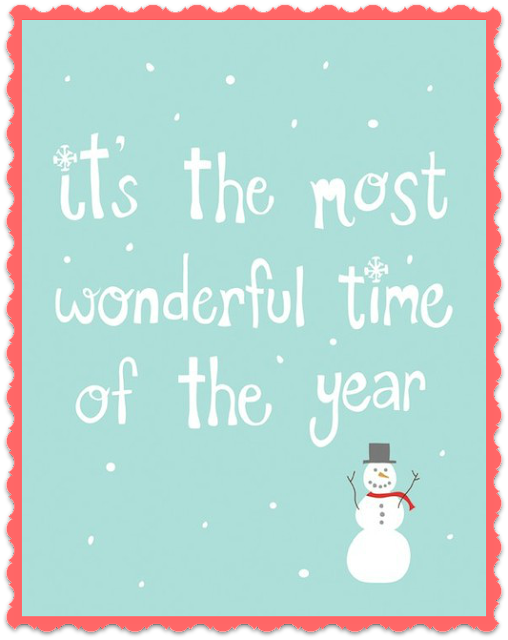 And, can you believe it is the last day of 2012? Wow! that's all I can say is Wow! 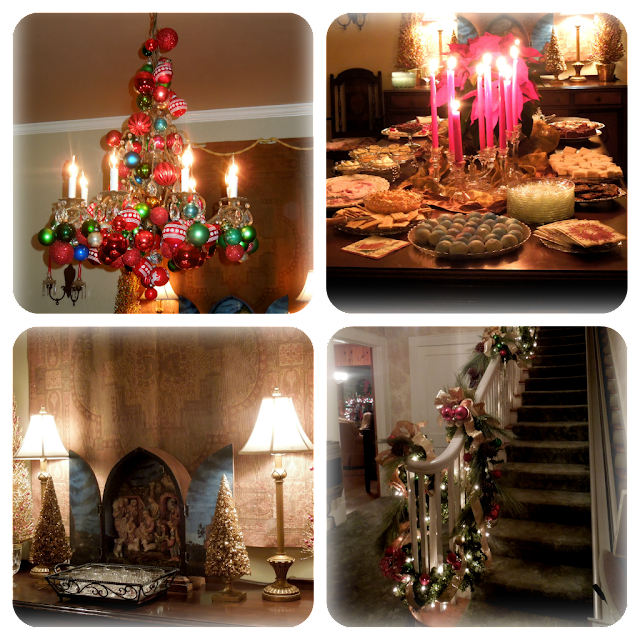 Our Christmas celebration with our family here was on Christmas Eve. We had our meal and then a celebration for Jesus' birthday. We did this throughout the years with our now grown children and it is extra special to be able to enjoy it with our Grans. Our Princess who is 3 years old was totally "into" it this year. As we read the Christmas Story she was so attentive and as we talked about Jesus being the light of the world, she could hardly wait for the candle on the cake to be lite so that she could blow it out. It is a blessing to realize just how much these little ones truly do "get it." 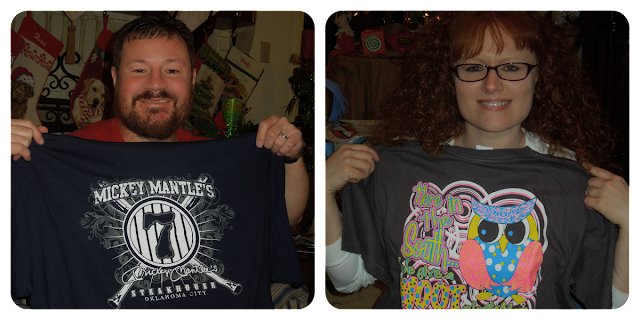 Our son and his wife can seemingly never have enough t-shirts, so it is generally always on their list for Christmas. They make such cute ones now days and I have fun shopping for the cutest or most unique ones I can find. In case you cannot read the saying on my DIL's, it says, "Here in the South we give a HOOT and sometimes we give a HOLLAR." And, of course, is the owl not the cutest! The Princess also got this precious Middleton doll from us. And, while I was just sure she would take right to her, such was not the case. 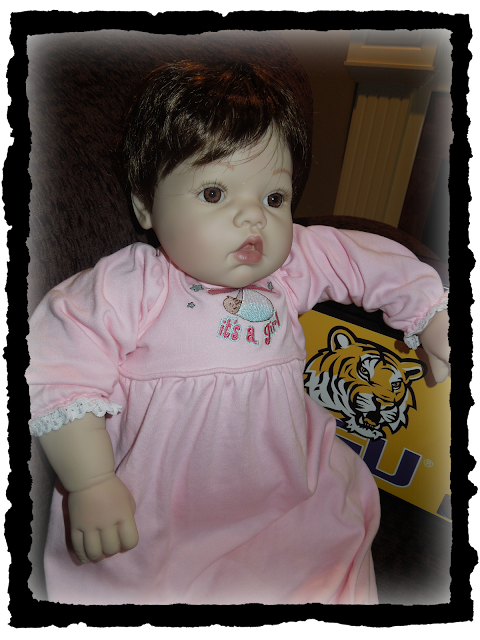 The doll is floppy just like a real baby and weighs 3 1/2 pounds, which makes her fairly heavy for a 3 year old. But, I'm sure in due time that they will bond and the doll will end up being one of Hanna Beth's best buddies. Meanwhile, my DIL assured me that she will take good care of the baby. ~smile~ I'm telling you if she had not gotten the vacuum cleaner first, the doll might have won her over a bit more, but, for now, the vacuum cleaner has "first place." 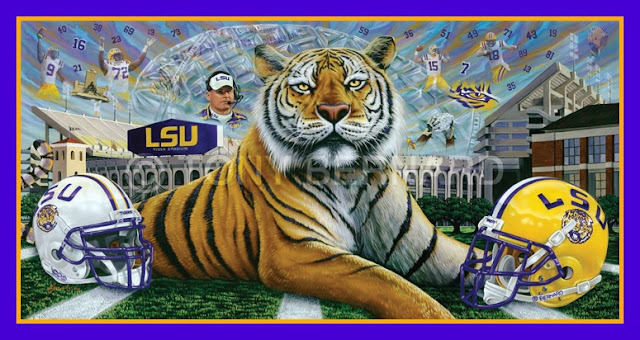 LSU Tigers (rated #8) take on the Clemson Tigers (rated #14) in the Georgia Dome. While I am far from a die hard football fan, I will be donning my purple and gold this evening as we head out to a New Year's Eve party to watch the game. And, our #1 son will be seated on the 40 yard line basking in the fact that he is actually at the game "live and in person." Hopefully he will leave there a proud Louisiana "boy." I could not miss the opportunity to share about one such affair that Hubby and I had the privilege of attending last evening. It was a holiday bridal affair. Combine those two and it can't help but make for an "evening to remember." The affair took place in what is called "The Garden District" of Monroe, about 22 miles from there. This is the lovely home that hosted the event. Does it not just have such a warm and inviting glow! And, how about that red door! This is the lovely couple, Will and Jennilee, for whom the affair was given. Aren't they the cutest! This is Hubby and me pictured with the brides parents. We have known this sweet family for over 40 years. We have shared many occasions with them over the years and hold their friendship very dear to our hearts. 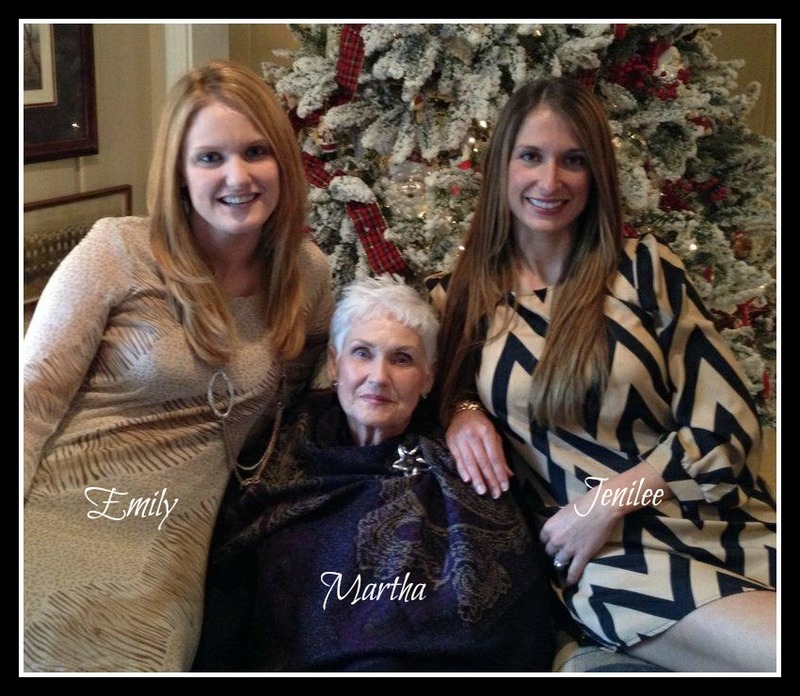 And, my precious friend, Martha, is the matriarch of this family. 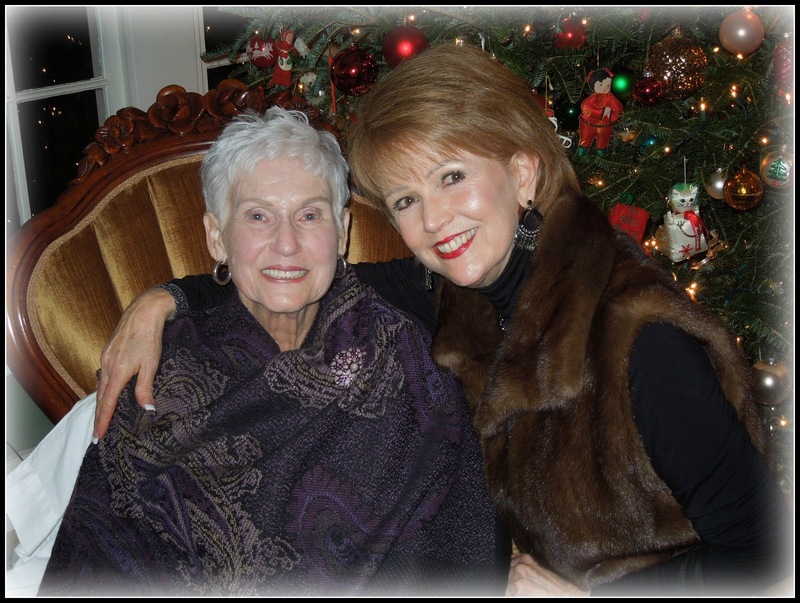 It was such a special treat that she was able to attend this event for her Granddaughter. Please continue your prayers for her. 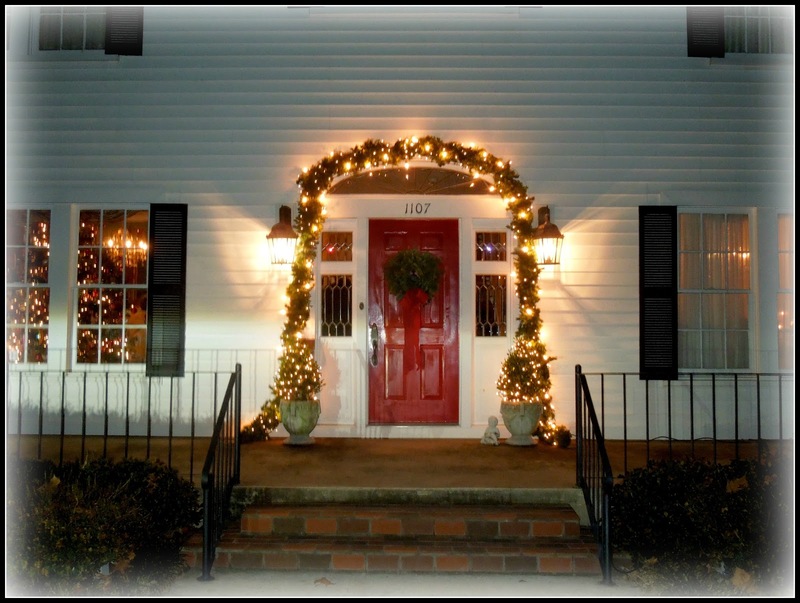 The home was decorated lavishly from "stem to stern." There was a "touch of Christmas" in every available place and so tastefully done. 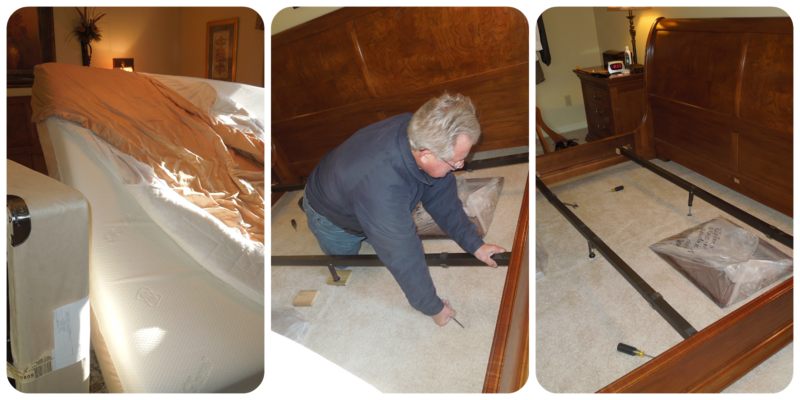 The master designer of all this lovely decor is this fine Southern gentleman, Chris. It just so happens that he is the Uncle of the bride. He and his lovely wife, Ellen, could be called "the dynamic duo" for sure. 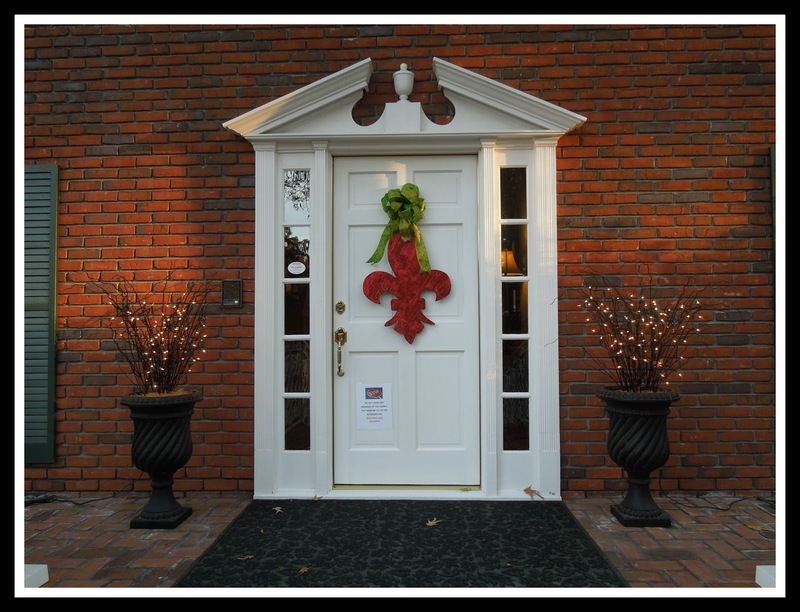 They can throw a Southern style affair that would rival anything at the Queen's Palace. That's the truth, they are amazing and Hubby and I so enjoyed sharing in this delightful event. Yep! 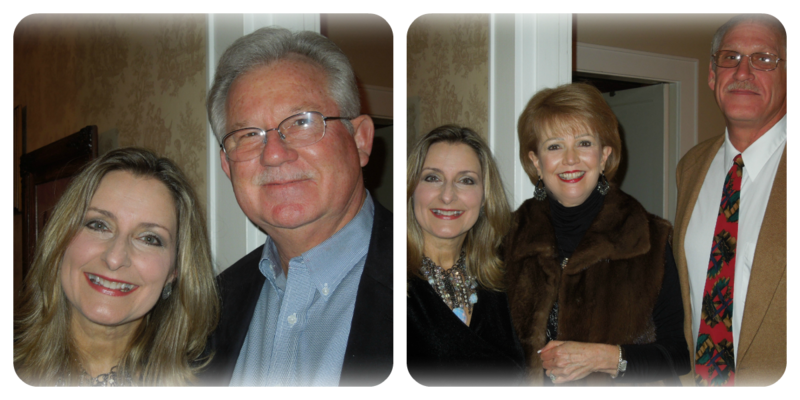 you just can't beat a "Southern Affair!" We traveled to Kansas last week and stopped to spend the night in Oklahoma City. 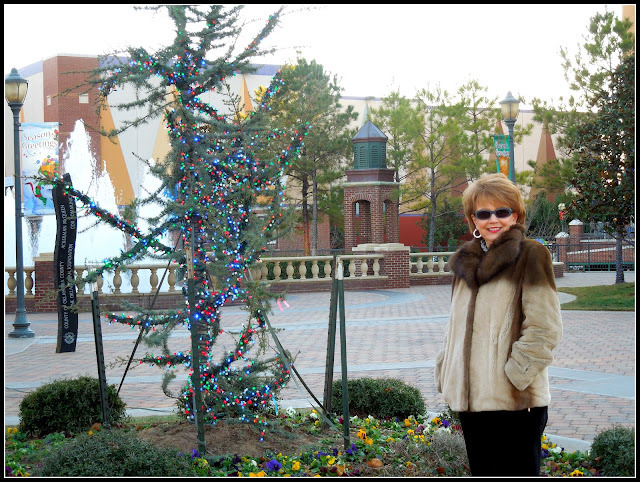 We stayed in the area known as Bricktown and we had such a fun time. We had a lovely dinner at Micky Mantle Steakhouse and then wandered around looking at all the lovely Christmas decorations. We drove on to Kansas the following day and there's nothing like hearing Clancy say, "Poppa and CiCi" when we drive up. Just makes our hearts nearly explode! 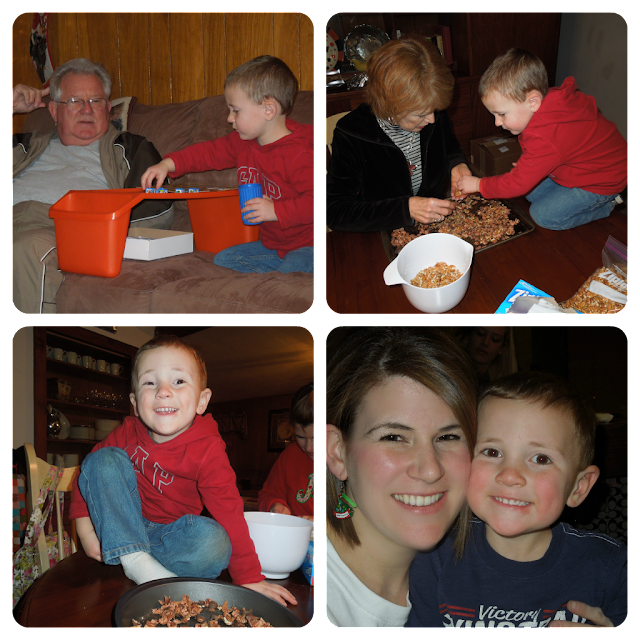 We played games, we shelled pecans, played outside and just enjoyed loving on Clancy. We did our gift exchange on Saturday and what fun to see the excitement in Clancy's eyes with each gift he opened. Have you ever seen a little boy with more expression? We arrived back home on Sunday evening and it was time for me to start preparing my fudge and other homemade goodies for delivery. As I've stated before, I have as much fun packaging my goodies, as I do making them. I'm almost finished but still have another couple to deliver. 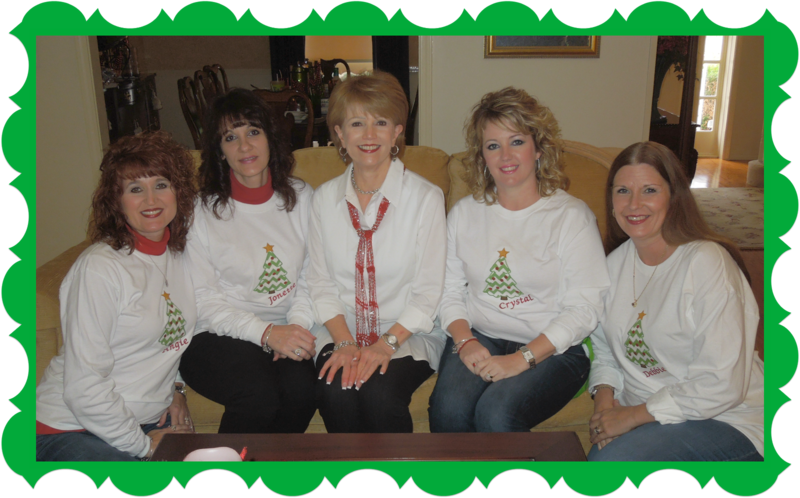 Our office staff always has a big party on their last day of work before Christmas and that was yesterday. I made sure that I was there when the fun began. 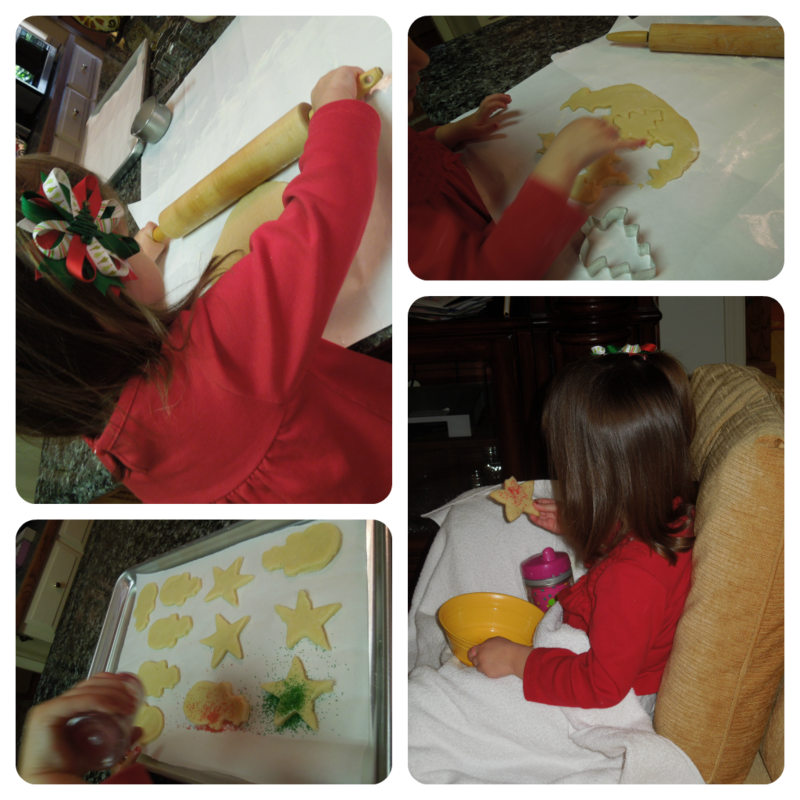 My Princess spent yesterday morning with me and we had a fun time making cut out cookies. Is there any little 3 year old girl that doesn't enjoy cookie dough and sprinkles? I think not! This evening we will be attending a Christmas bridal party to honor Jenilee, the granddaughter of my dear friend, Martha. Many of you will remember that Martha is fighting a tough, tough battle with breast cancer. 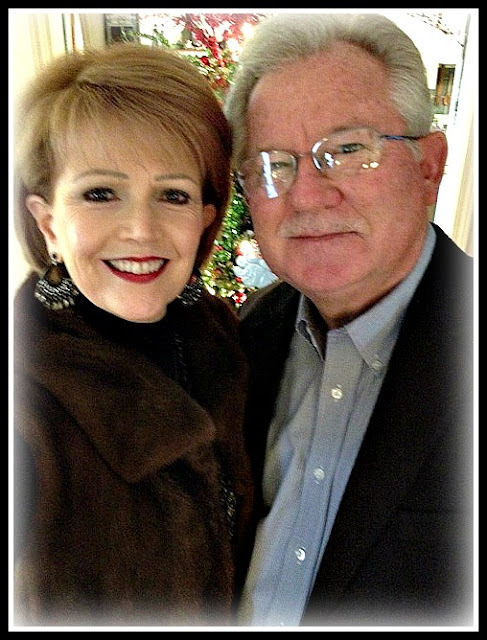 I continue to covet your prayers for her behalf as the road gets rougher and rougher. 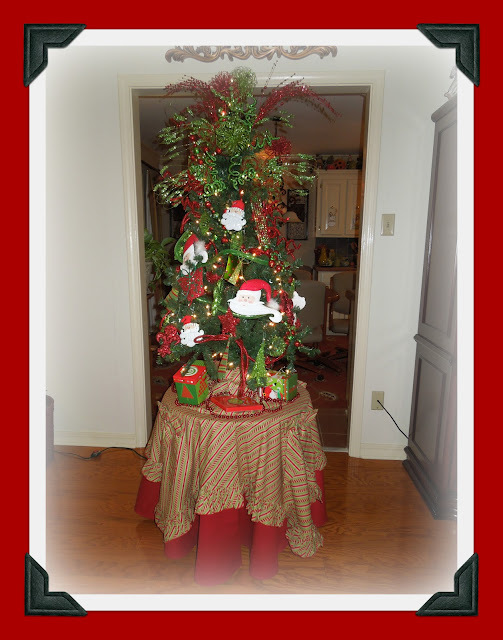 we will gather around this tree on Monday evening and have our family Christmas. I've been away from blogging for a week and it has become such a part of my life that I miss it when I am gone. And, I can't think of a better way to come back than with Hodgepodge. Thanks Joyce, I thoroughly enjoyed this week's questions. 1. How will you spend 'the night before Christmas'? Our family Christmas is generally on Christmas Eve. We will have our meal around 3:30 that afternoon and then attend a Christmas Eve Service at 5:30. 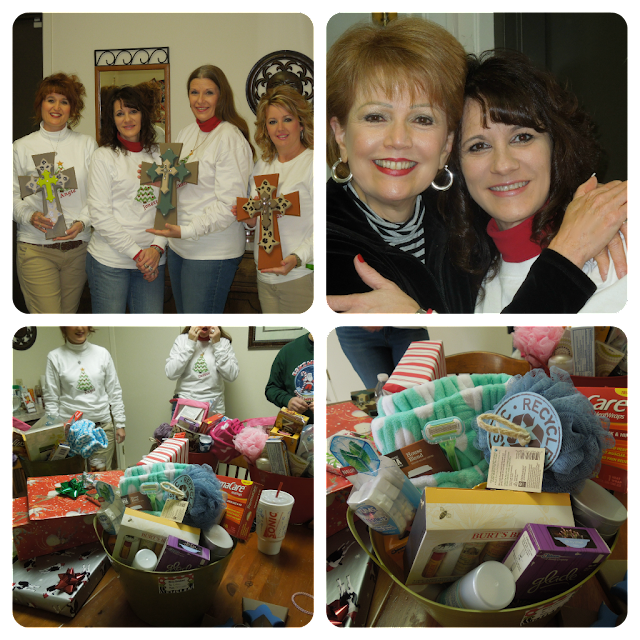 We will come home, have a birthday party for Jesus (complete with cake and all) and then have our gift exchange. It's a jam packed few hours with my favorite people. 2. What is one thing you are not? 3. Fudge-are you a fan? Your favorite flavor? 4. 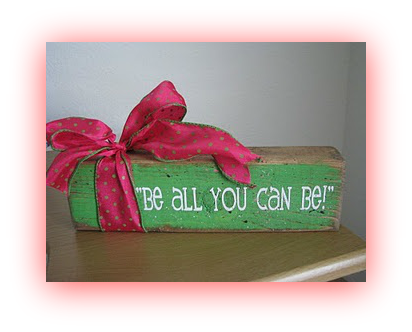 Did you attend any craft/vendor fairs in the month of December? Do you prefer homemade goodies or the more professional stalls? Are you giving any homemade gifts this year? I do not think that I have ever attended a craft fair in the month of December. I enjoy some homemade goodies if I personally know the vendor. Otherwise, no! I suppose I prefer the professional stalls best. Guess I answered the 3rd part of this question above. 5. 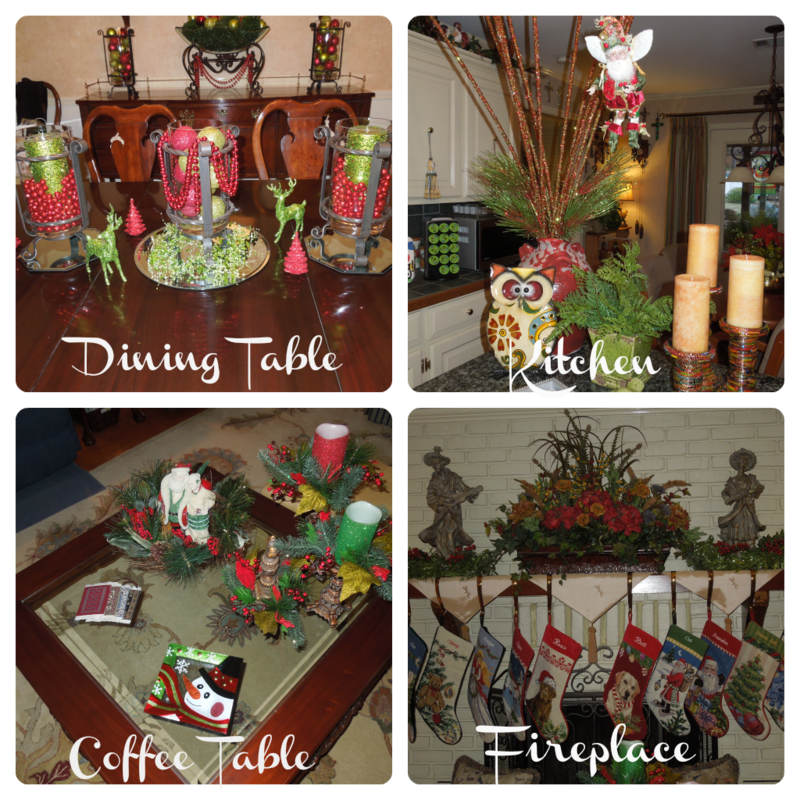 What's your favorite type of holiday gathering? A real "down home" affair would be my favorite. By that I mean, being with dear friends that are a part of my life day in and day out and have been with me through "thick and thin." Well, this is second to being with my family, that goes without saying. 6. 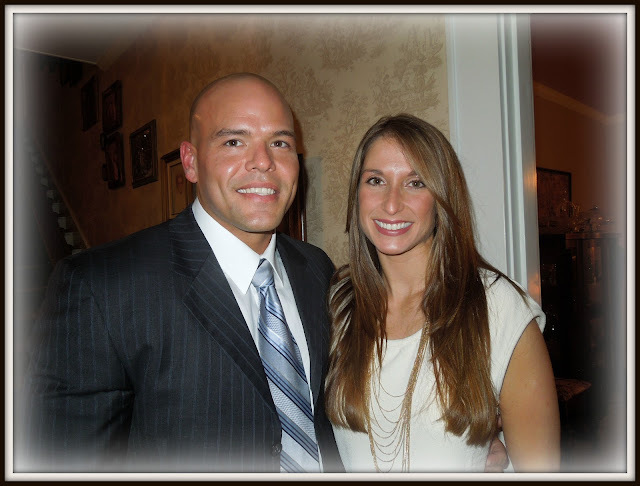 We're approaching a new year...what's going to be different in 2013? Oh, my, I wish I knew! I have a lot of personal things that I pray are different. I am a very organized and structured person and want to think that I use my time wisely. But, I am afraid that I could do a much better job in that area by doing more things with eternal value. I pray that's what is going to be different in 2013. 7. Share a favorite scripture, quote, saying, or song lyric relating to peace. As with many today, my heart is so heavy. There is the loss of all the precious children in the senseless shooting, there are those dealing with life threatening illness, and there are families dealing with who knows what all. This makes for such sadness and dark times for many. 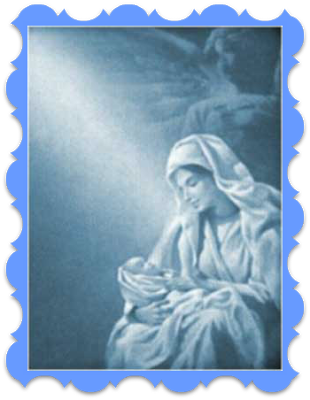 But, as I think of all of this I am reminded of that precious baby that was born in a manager to give us life abundant, no matter what we may be facing. 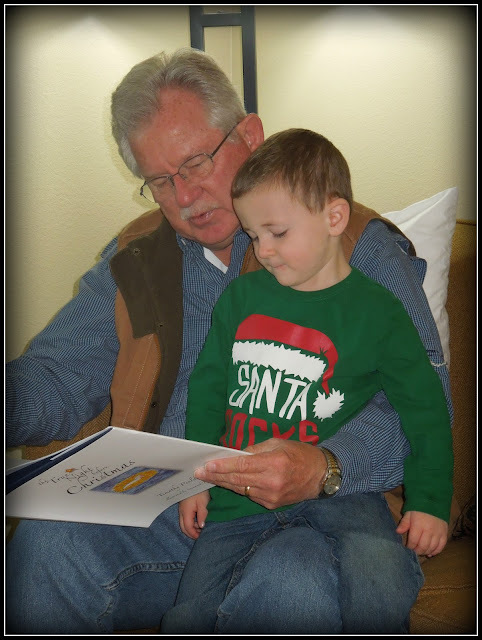 I leave you with this.........Hubby reading the Christmas story (as sweet Clancy looks on) before our gift exchange with our Kansas family this past weekend. Thanks Joyce for always "showing up." 1. So, when did you last take a walk in the woods? A stroll along the beach? A drive going nowhere in particular in the car? Well, can't remember the exact date of walking in the woods, but it was some time ago. I went with Hubby to put corn in his deer feeders. It's been about a year and a half since I strolled on the beach. Hubby and I were in beautiful Fairhope, Alabama at The Grand Hotel. About once a month Hubby and I get in the car and just ride with no particular purpose in mind. 2. Are you sending Christmas cards this year? About how many do you send? Photo card or something more traditional? How do you display the cards you receive? 3. What's a word you've heard too much of in the past week? Holiday instead of Christmas. It's crazy how often I've heard Happy Holidays where it use to be Merry Christmas. Just another sign of the times we are living in. So very sad! 4. 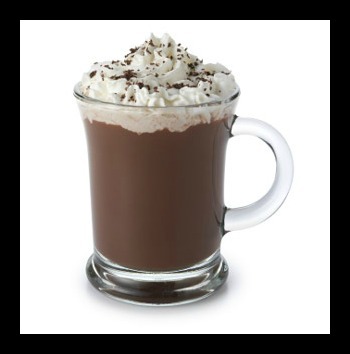 December 13th is National Cocoa Day-are you a fan? Plain or flavored? Marshmallows or no marshmallows? 5. 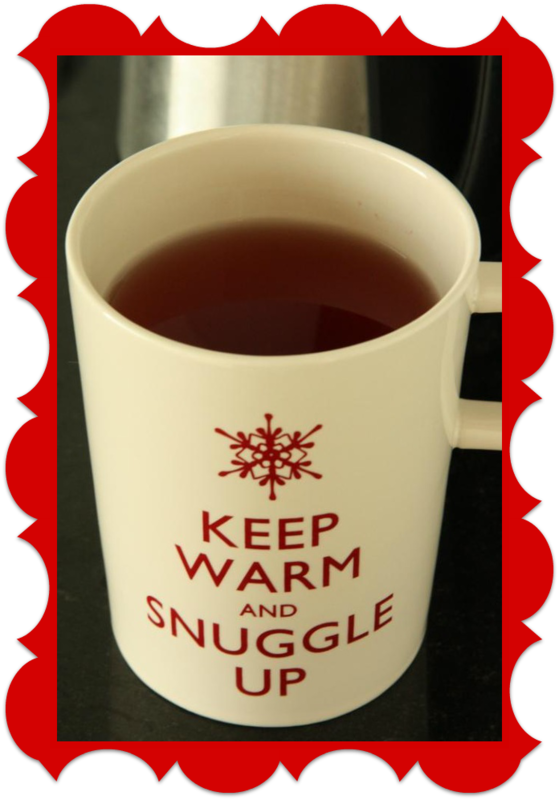 What is something you do to help alleviate the hectic pace of the Christmas season? I start thinking about Christmas way in advance. I get my shopping done very early, and I do most of my goodie making early. I decorate as soon as Thanksgiving is over and I am able to just really enjoy the weeks leading up to Christmas. I enjoy a little "hustle and bustle" but I cannot stand to be or feel hurried. 6. Besides jewelry, what's a favorite sparkly-glittery item in your home or closet? 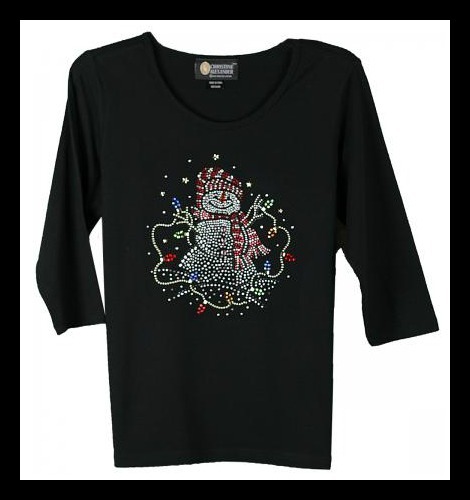 I have several tops and jackets with bling and I love them, especially at this time of year. I like for it to be tasteful, but a little bling is fun! My favorite "bling maker" is Christine Alexander. Her line of clothes is just the best and the bling absolutely never comes off if you care for it the way the label states. 7. Share a favorite line or two from any Christmas carol. Is Lord of all creation? Will one day rule the nations? Is the great I AM! As I mentioned earlier, Hubby and I are staying in downtown Oklahoma City tonight in route to Dodge City. We have really had a fun time today as we left home around 7:00 this morning. We arrived here around 4:30, had a lovely dinner at Mickey Mantle's Steakhouse (delicious food) and then rambled around Bricktown looking at all the beautiful Christmas lights. We did all this on foot as we are staying within walking distance. We ended up at Bass Pro Shop and enjoyed browsing around there. It was all about the journey today but tomorrow will likely be all about the destination - Dodge City here we come! I'm so glad that in the midst of all Carissa has going on these days that she stops long enough to host MM each Monday. I bet it gets her week off to as good of a start as it does ours. After posting last Monday about using buckets instead of stockings for our kiddos, I had several requests to show what they looked like. So, here you go! One is plastic and one is metal and I have two of each of them. These are for the adults and I haven't really been able to find suitable buckets for the Grans just yet. But, I'm on the look out and I'm just sure I'll find some soon. As I said, I found these about 5-6 years ago at Wal-Mart and I haven't seen any like them since. So, I take extra good care of them. They hold all different shapes and sizes of stuff very well. Yes, The Formidible Women are true Southern Belles and we take great pride in that fact. 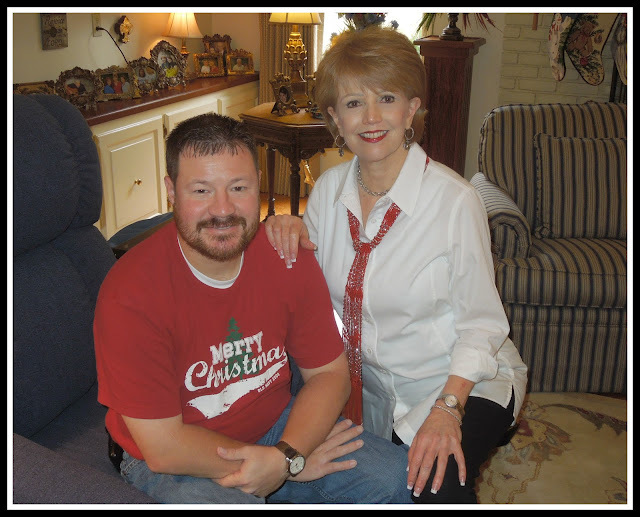 ~ grin~ This past Friday I hosted my annual Christmas Brunch for them. 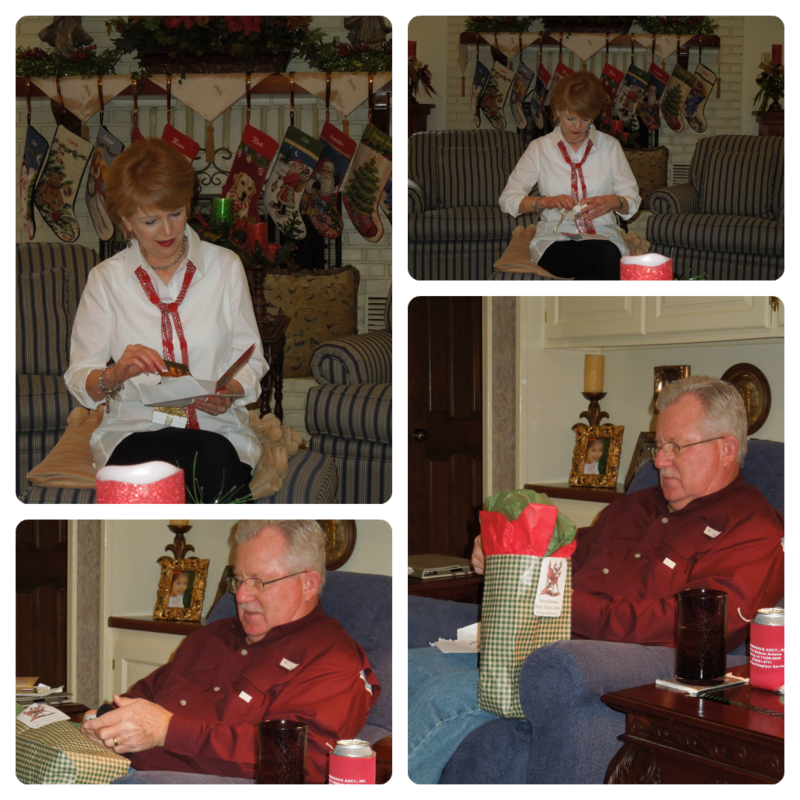 We all bring a gift and then have a gift exchange. 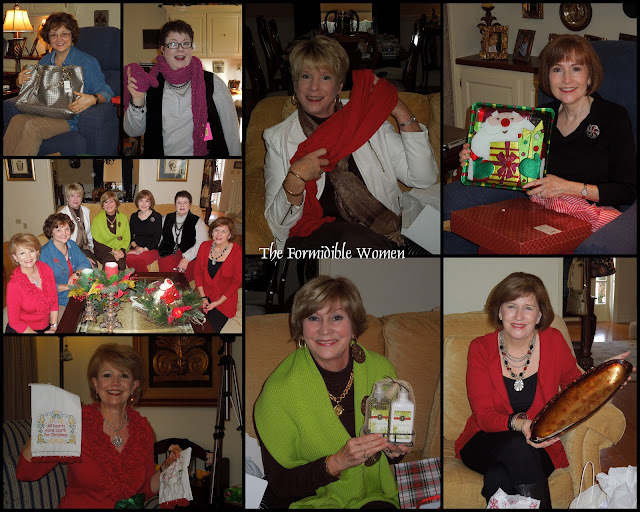 It is always a fun time for us to kick back for a couple of hours and just enjoy being together and celebrating a "Formidible Women style Christmas." Saturday evening we attended our Sunday School Department party and after dinner, we played Dirty Santa. Well, as the pictures show, it was most interesting. 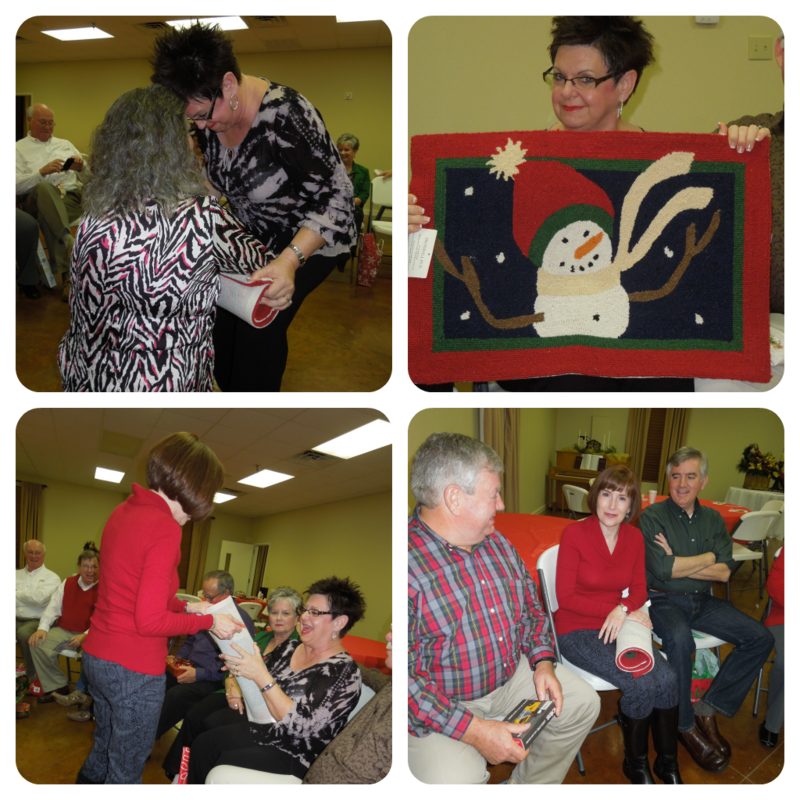 Someone brought the cute Snowman entrance rug and when Mary Lynn got it, she did not plan to let go of it. You can see that when Becky came to take it away, Mary Lynn got down on her knees begging her not to take it. But, Becky did not give in and very happily took it and she didn't intend to let it go either. But, Mary K. had other plans and she very politely took it from Becky and she left the party the happy new owner of the Snowman rug. Can I just say it was more fun "than a barrel of monkeys." 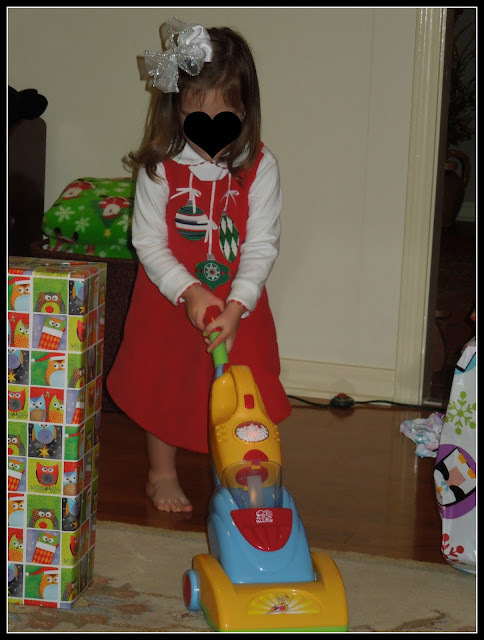 Just take a look at our Princess in her cute Christmas outfit. And, by all means, please notice the red shoes with the lime green poka dots. 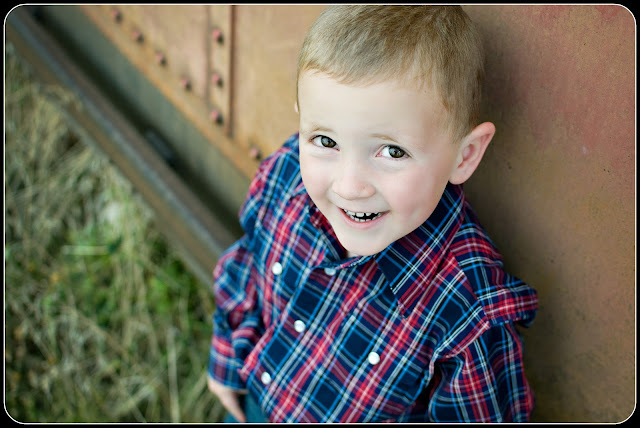 For heaven's sakes, how much cuter can it get? She was matching from her head to her toes and notice the "My Little Pony" that she has in her hand. Yep, that was her Mama's in 1983! DIL got it out last week and gave it to Hanna Beth and she hasn't put it down since. How funny! I'll be "laying low" in blogland the next week, but never fear, I'll be back with lots of pictures and tales! 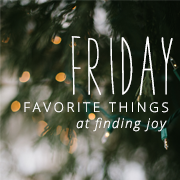 I'm excited about joining with Rachel today for Friday Favorites. 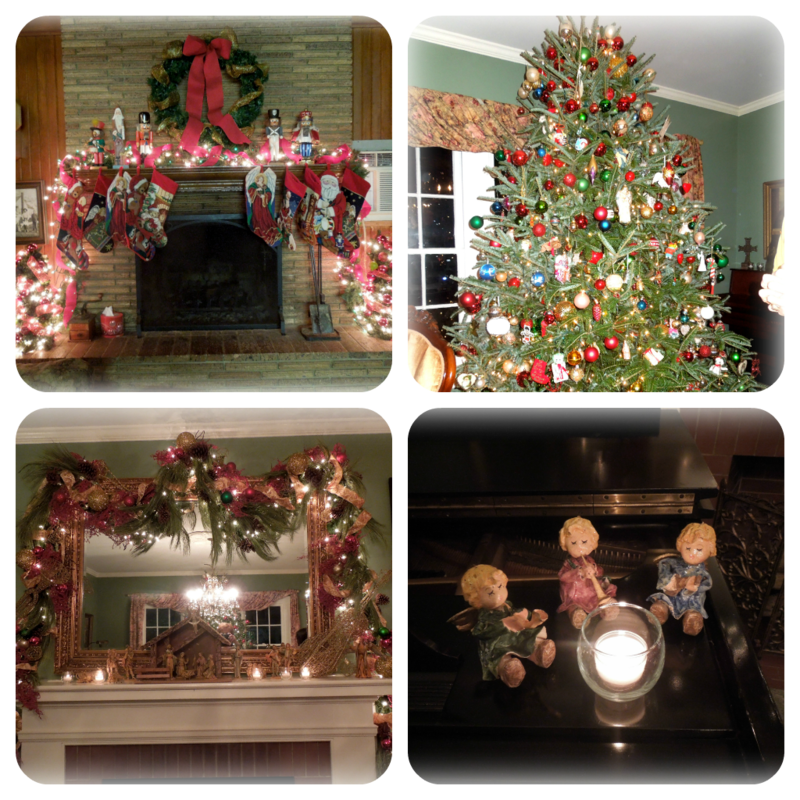 We've been celebrating the Christmas season in full force around here this week and it's been so much fun. I use to decorate in "grand style" but now I decorate in "mini grand style." It is just too difficult to carry all the decorations up and down our very steep stairs and since I'm the one that does the carrying, I have simplified things quite a bit. But, it is still very pretty and definitely feels "Christmasey" around here. For now, I'll hold you in suspense as to what our tree looks like. Since we will be loading up our sleigh and heading towards Dodge City this next Tuesday, I decided to do any entertaining I was going to do this week. 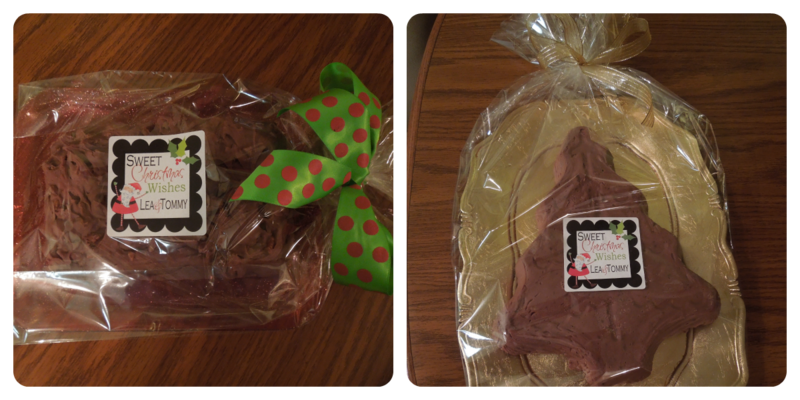 We will return home on the 17th, but I didn't want to come in and have anything to do except do my fudge deliveries. ~smile~ So, it has been a busy week of entertaining and I have enjoyed every minute of it. 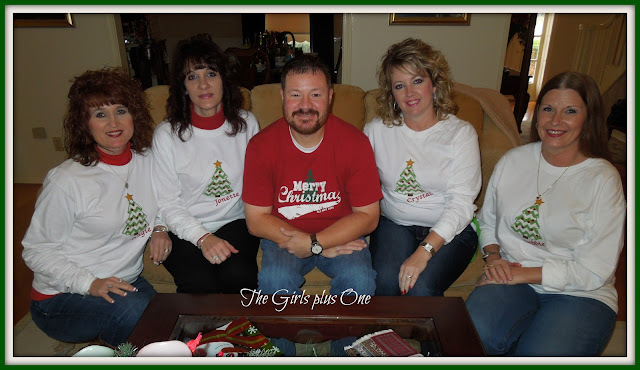 Every year I have Hubby's staff for lunch during the Christmas season. Our son and 4 great gals make up his staff and as I often say, they are "the grease behind the wheel." 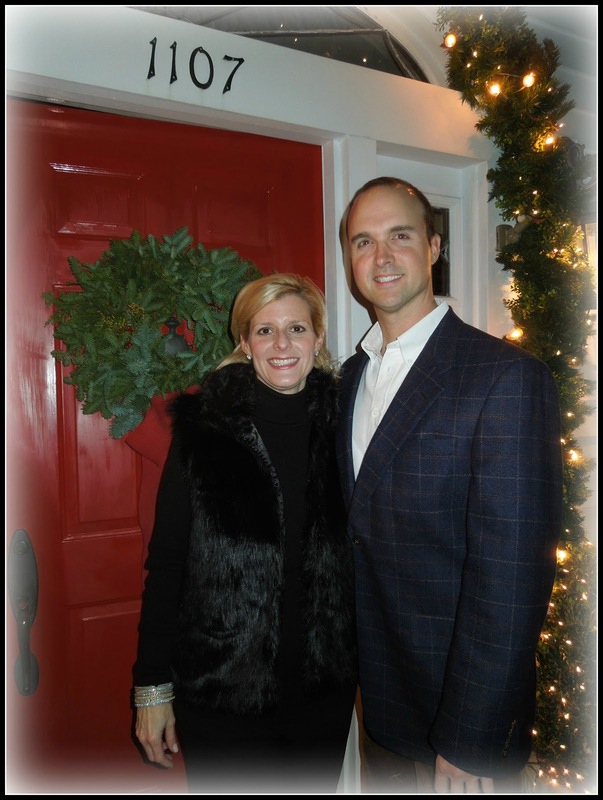 They do a great job and we look forward to sharing this special time of year with them. 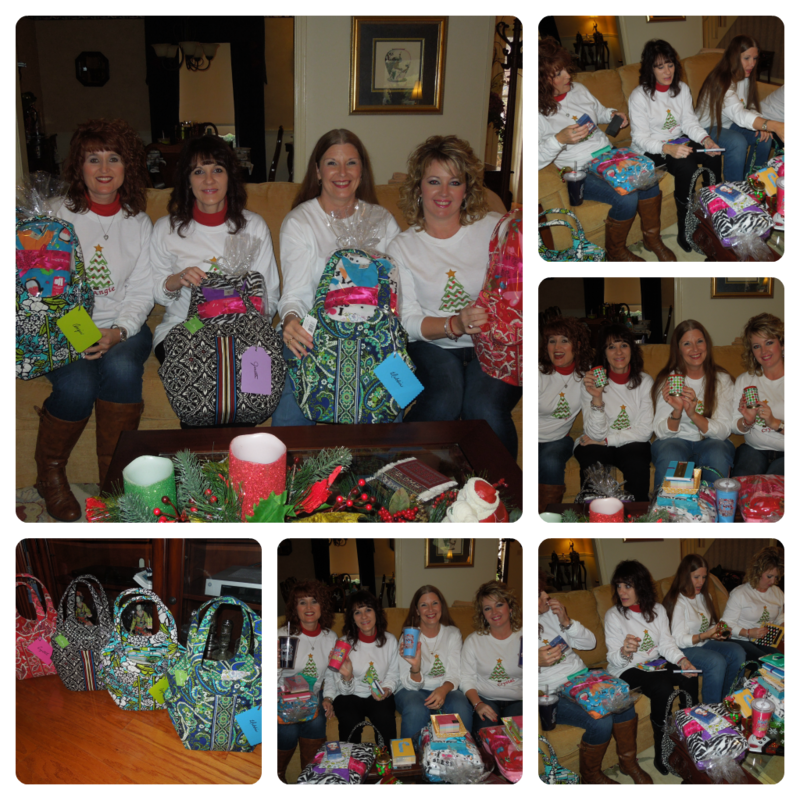 I always fix up some kind of "Christmas happie" for the girls and this year it was Vera Bradley totes filled to the brim with all kinds of goodies. VB had a big sale this summer on this particular tote and I could not resist getting them one. I think they were pleased. After they enjoyed digging through their happies they presented Hubby and I some Christmas goodies as well. They gave me a charm for my Pandora bracelet and Hubby got a beautiful Scrimshaw engraved knife. And, they gave us a nice gift card to Longhorn's. Yea! Last night we had a holiday dinner to attend and then today I'm hosting my annual brunch for The Formidible Women (my birthday group - pictures will be forth coming). Tomorrow evening is our Sunday School gathering. 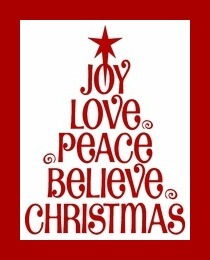 Indeed, it's been a week full of favorite holiday gatherings! Thanks Joyce for another week of great questions. It's always such fun to visit others and see their answers and the different ways we all interrupt your questions. Here goes to another week of Hodgepodge! 1. 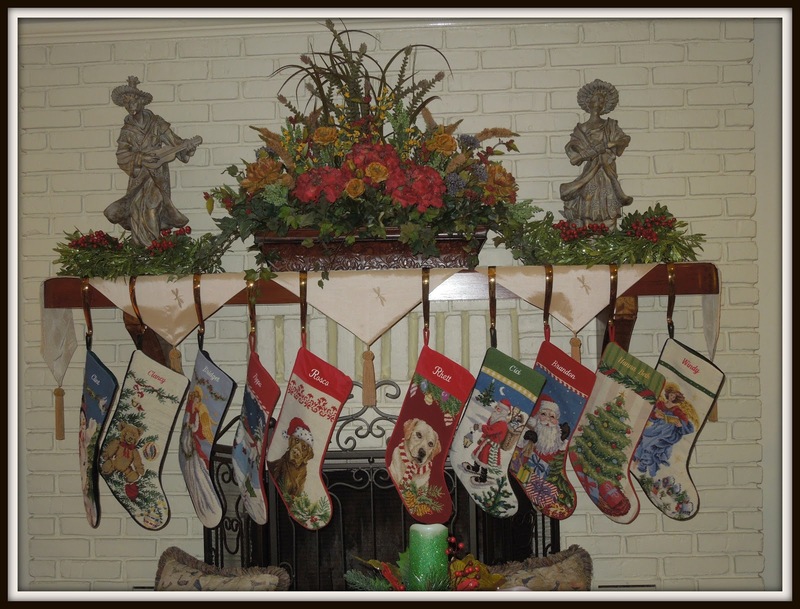 Share your traditions surrounding the Christmas stocking. 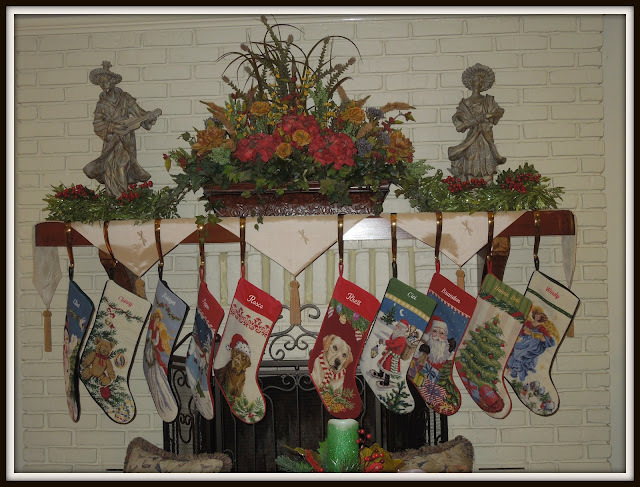 Well, our children would be the first to tell you that they get more excited over their stockings than their gifts. Except that they do not have stockings (well, they have stockings, as you can see from the photo above, but we do not fill them), they have buckets. Several years ago I ran across the cutest Christmas buckets, about a gallon in size, and they are so, so much easier to fill than a stocking. They are the very last thing that is opened and might I add, they are filled with some really neat and fabulous items. ~smile~ I think about them all year long and when I see items that "grab me," I grab them and save them for the buckets. 2. How many hours of sleep do you average at night? Is it enough? I average about 7 - 71/2 hours of sleep and it is plenty. I am generally asleep by 10:30 PM and I'm "up and at it" at 5:30 AM. I love the early morning and am my most productive in the early day. As the day winds down, so do I. 3. If you had to give up one thing for the remainder of this year what would it be? 4. The Duke and Duchess of Cambridge (or Wills and Kate as I like to call them) have announced they're expecting a baby. Do you follow news of the Royals? 5. For me, the sound of childhood is__________________. 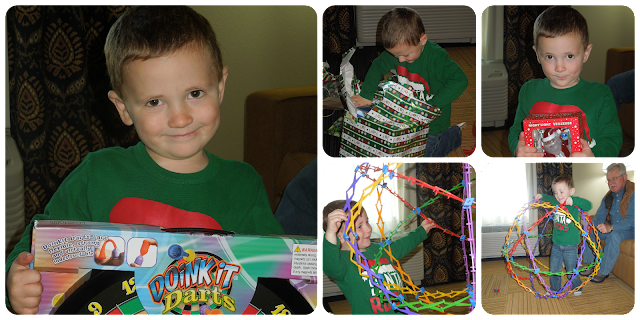 The sound of excited giggles, such as when it's almost time to open Christmas presents and they have waited just as long as they possibly can. 6. Fruit cake-yay or boo? What's your favorite dessert made with fruit? It's a "boo" for most fruitcake. I love how they look but I do not want anything in a fruitcake except red candied cherries and pecans. Forget the green cherries, the rasiens and/or dates and other strange stuff! 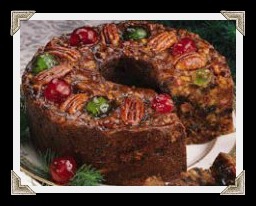 Some years I make Icebox Fruitcake and I only put the red cherries and pecans in it and it is "to die for." My favorite cake with fruit would, hands down be, Mandarin Orange Cake. Oh, me! makes my mouth water just thinking about it. So, so good, especially on a hot summer's day. 7. 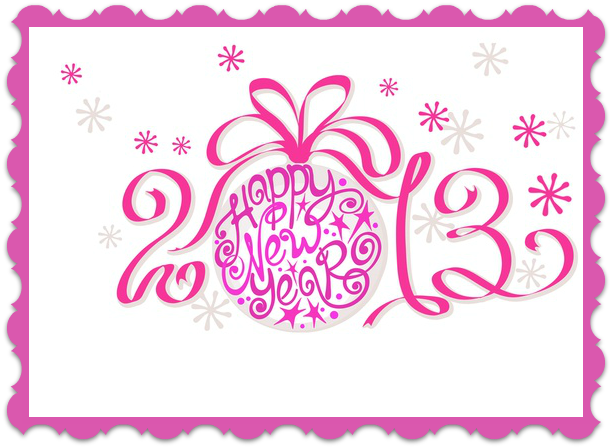 What is one thing you want to accomplish before 2012 comes to an end? I would like to once and for all realize that some things in life that are just what they are and they are not going to change and the best thing that I can do is ask the good Lord to help me accept them. Sounds simple enough doesn't it? Well, I find myself wanting some things to change so badly that I just completely forget that. Maybe I can realize this once and for all by Dec. 31, 2012. ~hope - hope~ (I bet I am the only Hodgepodger that didn't answer that with some type of project they wanted to finish before the end of the year) ho!ho!ho! I had no idea that there were a bazillion recipes for Chex Snack Mix. If you go to their website here, you will see what I am talking about. 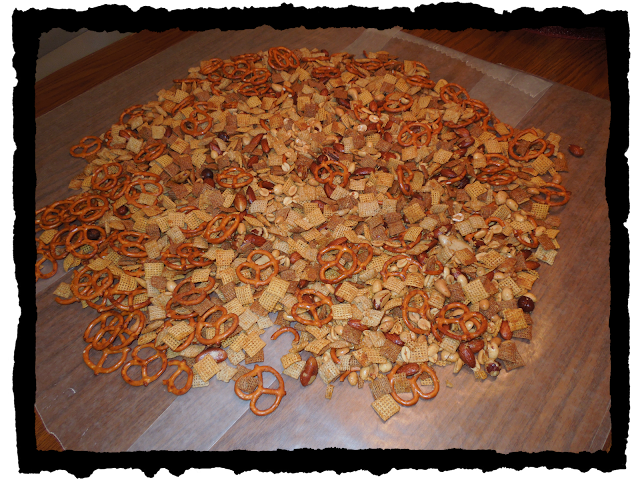 I found one called Cajun Kick Snack Mix and that sounded like something that would be very Louisiana and very good! I made a double batch yesterday afternoon and it took all of 10 minutes. The microwave has made this task all too easy and what a great "holiday happy" to package in a cute container and give away. It's for sure, you can't eat just one handful!